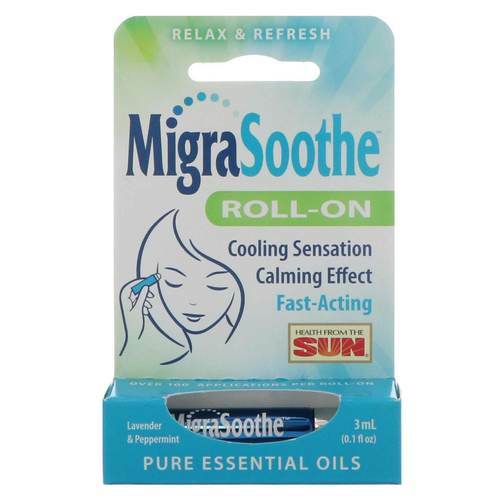 MigraSoothe Roll-On by Health From the Sun is the smart solution to head and neck tension. 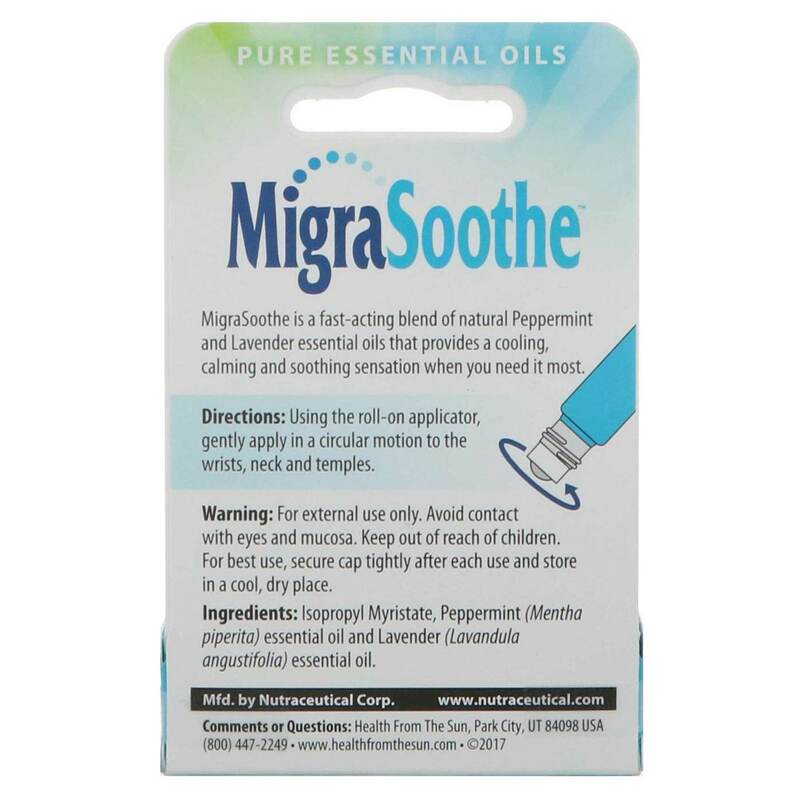 MigraSoothe Roll-On has a rollerball, making it usable at home, the office or in the car without the mess. The ingredients in this stick, peppermint and lavender essential oils, soothe aching muscles with a mild cooling effect. Each stick lasts up to 100 applications. Simply apply with gentle strokes to acupressure points such as the temples, forehead and nape of the neck. MigraSoothe Roll-On by Health From the Sun stops the pain so you can go about your day with ease. Get yours today! Warnings: For external use only. Avoid contact with eyes and mucosa. Product is not intended for use on pregnant or lactating women, children under the age of seven or those with epilepsy. Health From the Sun Reviews. The customer reviews posted below are based on individual consumer experiences and may NOT necessarily represent what expected results will be from using or taking Health From the Sun MigraSoothe Roll-On - 0.1 fl oz (3 mL). These results may not be typical and you should not necessarily expect to receive the same results. Actual results may vary. Very Good. Very fast effect! This MygraStick Roll-On by Health From the Sun is such a great product that I would recommend to anyone looking for relief! I tried this in a last stitch to avoid taking Advil or other pain relievers. And the results were great. I was shocked how well it worked. Just put a little on my forehead and it helped melt my headache away and keep it at bay. Love it! 54 people found this review helpful. Was this review helpful to you? I am very pleased and now always buy it. A great alternative to pills. I constantly suffer from headaches - this stick works as a distracting moment - mint gives a chill at the place of application. With the beginning headaches it helps immediately, if the pain is already very severe, then at least it will help to ease it. Although it did not work well on stopping a migraine, it does work well on tension headaches and headaches associated with seasonal allergies. Migrastick works especially good if the ampule is put in the refrigerator before use. Very cooling and soothing. I get sinus headaches alot. Whenever I feel one coming on, I take Migrastick. This product works great for that! I suffer from anxiety-related problems, and while I usually manage my condition fairly well, when I get under a lot of stress for a long time, I start to have physical symptoms. One of those is headache that will NOT go away, no matter how much medication I take, how much sleep I get, how much caffeine I consume, etc. THIS product, however, WORKS. It's amazing to suddenly realize that I don't have a headache when I've had one every day for weeks. I find the scent soothing, and I find that if I use some the night before I go to bed, I sleep better. I don't think this works for everyone (my husband, who is a lifelong migraine sufferer, doesn't get much benefit from it, for example), but for me, it's been a godsend, and the only thing that provides any relief for chronic stress headaches.